With my daily coffee fix in Freo unsatiated by Ginos Cafe Restaurant, I was in search of another brew. Polling the locals, I was finally directed to a small cafe that was reputed to serve the best coffee in Freo, and one of the best in Perth alongside breakfast and lunch. Located on Market Street, I walked into the unassuming cafe of Hush Espresso that reminded of a greyer Market Lane near Queen Victoria Market in Melbourne. The cafe was filled with people queuing to get their takeaway morning fix and folks seated at brekkie. With time on my hands, I decided to take a seat among the Freo residents on the stools along the footpath just outside the cafe. My expectations were rising just overhearing murmurs of how excellent the coffee was and Hush being the best place for coffee. With the morning crowd finally thinning, I had the choice of seat in this semi-dilapidated warehouse-styled cafe. There was no eclectic interior to draw customers like in other modern cafes so the focus was really all on the coffee. I had a latte on my first visit for AUD3.50. 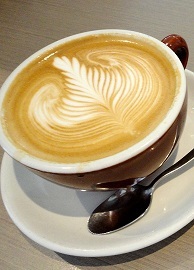 It was delivered efficiently and effort was definitely made to craft an artistic Rosetta into the dark and rich crema. It smelled like aromatic coffee and definitely tasted like a latte with a flavoursome amount of espresso and milk at the right temperature. A hands down winner over the java I had in Gino's and Kailis' in Freo, popular Pellegrini's in Melbourne and even the expensive Italian blend in Palazzo Versace on the Gold Coast. I returned a second time during my stay in Freo and ordered a cappuccino. It turned up in good time armed with a dusted frothy head and tasted silky, nutty and delightful to the palate. I can't really say I've gone to coffee heaven on both counts when comparing to the greats I've savoured in other places but they definitely beat the burnt coffee water available on "Cappuccino Strip". Seems the locals know where's the best coffee in Freo. Thank you for sharing Hush with me.